I've only eaten this dish once in the mid-80's when I made it. The recipe came from my mother's Lubbock Women's Club cookbook. I was living in Long Beach (Bixby Knolls) with my partner. I was a flight attendant for Western Airlines (later Delta). Bixby Knolls, at the time, was this idllic place surrounded by LA urban blight. This was in the mid-80's. The names Bixby Knolls and Ham Lear seem to come from a similar time place, by the sound of it. We cooked this meal in memory of one of my most beloved friends, Alan Lane Hayworth. He died in the early days of AIDS. Not a day goes by that I haven't thought of him. He was taken too early. I so wish he were here in today's world to share the crazy world we're currently living in. Alan lived in Texas, where I'm from. We would talk long distance (a concept that current generations have no clue) periodically to get caught up. On one of our calls he would asked when I picked up the phone: "What are you doing?" I answered "I'm making a ham loaf." For some reason, Alan started howling with laughter and teasing me about "ham loaf." I think he found my response and my life bit a bit too suburban housewife. I haven't made this recipe since. My mother and I made this a couple of nights ago. We did so with smiles on our faces, thinking of my friend, Alan. Gone, but never forgotten. I think Ham Loaf is an old time thing. But it is heavenly. 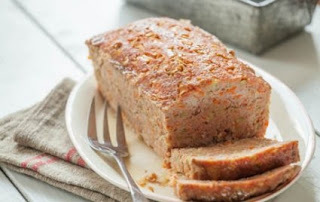 It puts a meat loaf to shame. The menu is below. I think that to make this a more modern recipe I'd decrease the sugar because it is too sweet. The sugar is used to make a sauce. At this point in my life, I am not a big fan of sweet entrees. I'll make this dish again. And everyday, I'll remember my beloved friend Alan. Mix first 7 ingredients together and press in loaf pan. Mix brown sugar, vinegar, water together and pour over meat. Bake in a 350 degree preheated oven 1 hr. 10 min. Pour off liquid & thicken slightly with flour. Meat can be made into patties. OPTIONAL: Just before serving put sauce and pineapple (optional--I can't stand it so omitted it) on loaf/patty and broil briefly. Sounds good, but since I'm in the process of giving up eating meat, my lips will never know. Rick I always enjoy hearing from you. Are going vegetarian/vegan or some other diet? Just vegetarian. I got upset about the dog meat festival in China and realized that I'm being hypocritical by eating meat. RACHEL MADDOW is a goddess!